Bighorn Meadows Resort -Radium Hot Springs, B.C. 10 Bighorn Boulevard, Radium Hot Springs, B.C. Bighorn Meadows Resort is now selling The Residences at Bighorn Meadows. Enjoy a hassle-free lifestyle when you own in this professionally managed resort community on The Springs Golf Course. A perfect location for those who wish to relax, unwind and rejuvenate! Bighorn Meadows Resort is privately nestled between the 9th and 10th fairways of the prestigious Springs Golf Course in Radium Hot Springs. The Bighorn Meadows Resort community offers a magnificent location with an onsite management company, resort amenities and 24-hour security to provide owners with an enjoyable, worry-free vacation home. At Bighorn Meadows Resort we sell full ownership or you can own a fraction of a residence as an additional option for owning a vacation home. One of the many benefits of living in a resort community such as Bighorn Meadows Resort is the amenities that are included and maintained for you. The on-site amenities at Bighorn Meadows Resort consist of an outdoor pool, 2 hot tubs, fitness room, meeting lounge, playground and impeccably maintained grounds with walking paths. Other benefits include golf discounts, owner exchange programs and rental management. Comfort, convenience, open and inviting best describe floor plans for the new residences at Bighorn Meadows Resort. The kitchen/dining area is open to the living room that flows seamlessly onto your covered patio. It provides a free flowing space without the usual optical impedance and barriers that separate these areas for gathering. Your time with friends and family should be about enjoying each other’s company. Spaces like these allow you to make the most of your time together. The Residences at Bighorn Meadows Resort are constructed with high quality exterior finishes that will last and keep your home looking good for years to come. We are a licensed Residential builder and are proud to be members in good standing with the Home Owner Protection office of the Province of British Columbia. Your peace of mind is important to us; As a result, we are pleased to include new home warranty with all of our Residences at Bighorn Meadows. 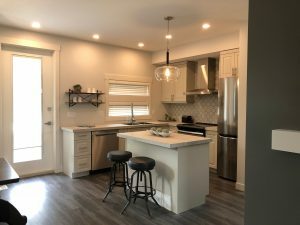 Less than 50 families will have the opportunity to own a Residence at Bighorn Meadows in the beautiful Columbia Valley; the rest will have to pay you rent! Contact us at 1-888-766-9637, visit BighornMeadows.ca, or email info@bighornmeadows.ca to learn more.